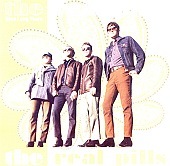 High energy, danceable garage rock you will sweat too, The Real Pills' debut, self-titled full-length contains non-stop musical ruckus in the form of manic vocals coming from everywhere, burning guitars, and the bounce of the rhythm section, which keeps the party lively and fresh. This is nothing new, but they're not trying to reinvent the wheel, they're just trying to make you have a good time, forget your worries, and get down a bit. And they successfully carry out their mission with fifteen quick, juicy nuggets of rock 'n' roll in its purest form. I'll give this an A.